Soo, I was trying to post on the gift guide but either Kinja is twitchy or commenting is closed? Anyhow, I wanted to share something I just bought for myself. 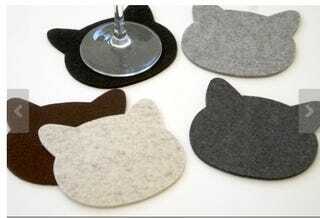 Felt cat coasters! They are amazing, soft, and pretty. And they are thick enough that they keep your coffee table dry. They come in 3mm and 5mm, but the 3mm ones were totally thick enough! $16 on etsy. If you're not into cats (huh? ), there are a whole bunch of other shapes of coasters on there too!